Bea by Rainbow Club. 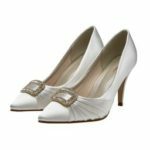 An elegant low heeled ivory satin court shoe with rounded toe, a beautiful satin overlay and bliss lining for extra comfort. Last pair size 9.5, wont be restocked.